Continuing from Page One with Exercises STH3, 4 and 5, plus intense STH3A, 4A and 5A, then 'round-up' exercise STH6/6A. Exercise STH6/6A revises the five seventh-span patterns on one note, C.
Exercise particular caution with this exercise! 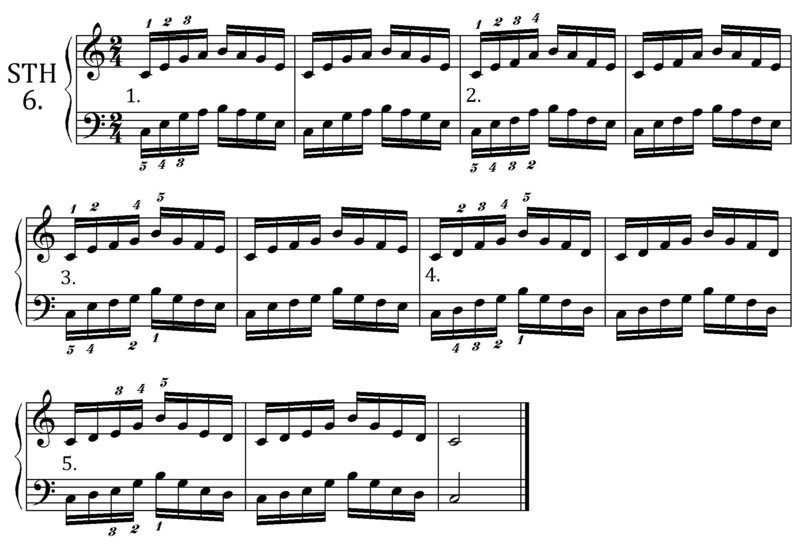 Note that the left hand plays Type 1, 2, 2, 2, 1 patterns, in that order. That is, Type 1 for right hand patterns 1 and 5, and Type 2 for RH patterns 2, 3, and 4. Go on to Spreading the Hand Page Three for another take on these exacting seventh-span patterns.